Nitrogen is one of the prehsitric elements. And its use as ammonium chdirde has been known to Herodotus, Middle Ages civilizations and Alchemists. It was known as aqua fortis the strong water. And mixture of hydrochloric and nitric acid was formed that has the ability to dissolve the Nobel metal and the king of metals, gold. The solution was termed as aqua regia (royal water) . Nitrogen was discovered as a novel element by Daniel Rutherford (1722) and he termed it as the noxious air . He found that it was that component of the air that did not support combustion. During the same time, several other chemists, including Joseph Priestly, Wilhelm Scheele and Henry Cavendish carried out various experiments to discover and identify nitrogen and they termed it as phlogisticated air or burnt air. Earlier, Antoine Lavoisier used the term azote (Greek) meaning no life for nitrogen, which later became choke or to suffocate and the term pnictogens (Greek for choke) was assigned to Group 15 due to nitrogen. In 1970, nitrogene (French word) was given to the element by Antoine Chaptal and in 1974 it became nitrogen in English language. Sodium nitrate and potassium nitrate (then termed as saltpeter) were the earliest known compounds of nitrogen that has various industrial, military and agricultural applications. Nitrogen is a very common element, both on Earth and in the universe. It is ranked as the 7th most abundant element in the universe and is present in the Solar System and the Milky Way. If forms a distinct surface coverage on Pluto. In diatomic form, N2 gas is the most abundant free element in the Earth’s atmosphere and makes about 78% of it, along with oxygen, carbon dioxide etc. Nitrogen is also prevalent in the living systems, as it is part of various vital components of a living organism, including proteins, amino acids, DNA, RNA and in the energy currency of the cell, ATP. It is considered as the 4th most abundant element in the human body and makes about 3% by mass of the body. A specialized cycle keeps the natural balance of nitrogen between the biotic and abiotic component (atmosphere, organic compounds and biosphere) of the ecosystem in order. Nitrogen is a colorless and odorless gas. 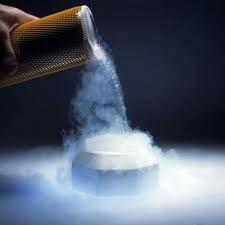 Liquid nitrogen resembles water in its appearance, as it is colorless. Nitrogen is a very light gas and is the lightest gas in its group (Group 15). Molecular nitrogen undergoes liquefaction at -195.79C and freezes at -210 C and acquire a beta hexagonal structural assembly . The alpha phase is another allotropic form of nitrogen that it acquires by arranging in a cubic crystal when exposed to temperature lower than -237C. The density of liquid nitrogen is 0.808 g/mL which is about 80.8% denser than water. Nitrogen is very reactive. The triple bonds present in N2 are extremely strong and in fact are the second strongest bonds in elemental chemistry. Except for Nobel gases, nitrogen can react with almost every element in the periodic table and forms nitrides. Nitrogen is widely used in the manufacturing of nitrates and ammonia that are considered as the key fertilizers all over the world. Nitrogen is used to make adhesives and glues (in the form of cyanoacrylate). Nitrogen is used in to manufacture high quality stainless steel. Nitrogen is used to make high-strength fabric, that can withstand tearing and wearing. Nitrogen is widely used in pharmaceutical industry for the manufacturing of various drugs including antibiotics, and hypertension controlling drugs (nitroglycerin). Nitrogen is used to inflate tires of aircraft and race cars instead of natural air. Nitrogen is used as a coolant or refrigerant and used for cryopreservation purposes of biological tissues, cells and blood. Nitrogen is non-toxic in elemental form and at normal atmospheric pressure. When inhaled in an enclosed space or at high partial pressure, it can prove to be very toxic. Such incidents are common in astronauts and scuba divers, as they are exposed to high levels of nitrogen. Inhalation of nitrogen at a partial pressure more than 4 bar can cause severe tissue damages and mental disorders. Nitrogen can displace oxygen and readily dissolves in body fats and blood and cause decompression sickness, which can sometimes prove to be fatal. There are two stable isotope of nitrogen, nitrogen-14 and nitogen-15. Nitrogen-14 is very abundant and makes about 99.6% of naturally occurring nitrogen. There isotopes are produced in the stars. Nitrogen-15 was discovered in 1929 by S.M. Naude. There are ten artificially produced radioactive isotopes of nitrogen, ranging from nitrogen-12 to nitrogen-23.
. Weeks, Mary Elvira (1932). “The discovery of the elements. IV. Three important gases”. Journal of Chemical Education. 9 (2): 215. Bibcode:1932JChEd…9..215W. doi:10.1021/ed009p215.
. Gray, Theodore (2009). The Elements: A Visual Exploration of Every Known Atom in the Universe. New York: Black Dog & Leventhal Publishers. ISBN 978-1-57912-814-2.